The prosecution is willing to hand more corruption or major crime cases to police but will continue to take control of overall investigation procedures, prosecution and parliament sources said Tuesday. Prosecutor-General Moon Moo-il outlined the prosecution's proposal on reforms of the prosecution and judiciary to the National Assembly's special committee. The proposal by the head of the Supreme Prosecutors' Office is a response to the Moon Jae-in government's key policy pledge to reform state investigative bodies often blamed for holding excessive authority and abusing it in the course of probes leading to indictments. Moon's reforms call for reducing prosecutorial power and creating an independent investigative body that exclusively handles corruption of high-profile figures, including top incumbent government officials and their families. 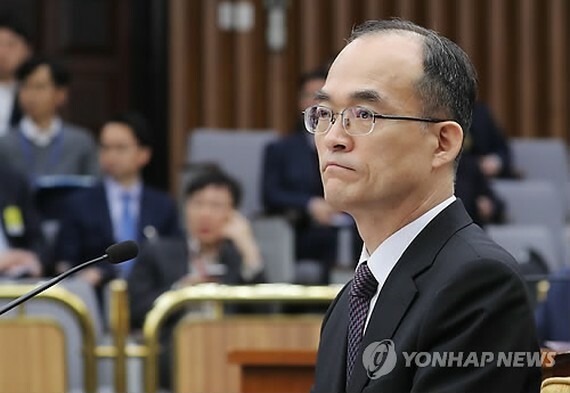 In response, the prosecution proposed that it only take corruption cases that fall under their jurisdictions in five major cities in the country -- Seoul, Daejeon, Daegu, Busan and Gwangju -- where regional higher prosecution offices are located. They will hand over all intelligence sources to police in all other regions if cases do not require their direct engagement, according to the prosecution. They are also considering setting up a separate investigative bureau within the Ministry of Justice that only deals with narcotics or mobsters as a way to split authority. The prosecution made clear though that they will remain in charge of the overall pursuit of an investigation, as it is necessary to take heed of any possible violation of human rights or errors that may occur over the course of an investigation. The prosecution also rejected the idea of giving police a mandate to close a case or file for an arrest warrant -- both of which are exclusively handled by the prosecution currently -- citing the need for legal review by the prosecution. Regarding the issue of setting up a new investigative body for high-profile corruption, the prosecution agreed with the establishment of such a body but stressed its mutual commitment to such cases, signaling its refusal of the government's plan of an outright transfer of jurisdiction to the envisioned agency.